Jennifer is a teacher, photography artist, herbalist and flower-essence practitioner. She discovered TriYoga and Theresa in 2002, finding the “perfect bridge” to a supple, athletic body and her intuitive, creative professional work. In 2011, she became a certified TriYoga Basics teacher, inspired to share TriYoga's transformative practice as part of a holistic pathway to self-awareness, self-care, and resiliency through trauma, injury and life’s inevitable challenges and changes. In addition to teaching Basics in Spring Mills, Jennifer works with individuals with health concerns and teaches healing workshops that combine yoga and herbal knowledge. Jennifer lives and collaborates with her husband Gerald Lang on their Georges Valley farm. Look for their donated artwork at each of the TriYoga studios. Kerri's experience on the path of yoga brought her to teaching as a way of sharing her love of TriYoga. She has been teaching since 2011 and enjoys creating an environment of relaxation and fun in her classes. An experienced massage therapist in practice for over 10 years, Kerri has witnessed many of the challenges life presents to our bodies and minds. Her knowledge and skill in the world of therapeutic bodywork complement her interest in helping others deepen and expand into the healing potential of conscious movement and breath. Teaching yoga is the last thing Justine ever thought she would be doing. In her early 30s she was diagnosed with depression and several autoimmune diseases, the byproduct of unrelenting stress and a demanding professional life as a social justice attorney. Justine found wellness, calm, and joy with the help of TriYoga practices. She became a teacher in 2011 so she could help students bring those benefits into their own day-to-day lives. Certified in Basics and the breathing, concentration and meditation practices known as Prana Vidya, Justine teaches as a sub, works with individuals and offers group workshops. Joanne discovered TriYoga later in life. Seeking strength, balance, and stress reduction, she found a practice that simultaneously provides an avenue for self-discovery. Joanne grows more comfortable and confident in her body and spirit as she ages. With a teaching style described by students as down-to-earth, intuitive, and gentle, she especially enjoys working with those wishing to remain healthy, flexible, calm and focused in their wisdom years. She is the mother of 3 adult children, grandmother of 5 grandchildren and a recent Penn State University retiree. In 2013 Sandy fell in love with the calming flow of TriYoga. Ever since, she’s been enjoying and exploring the embodied wisdom that’s revealed through the power of peaceful focus accompanied by a conscious breath. After studying with TriYoga teachers Theresa Shay, Citrini Ware, and Matt Beigle, Sandy received her TriYoga Basics certification in the spring of 2016. A native of Annapolis, Maryland, she lived and worked in Washington, D.C. and Philadelphia before moving to Boalsburg. With its abundance of nature and local food, Central Pennsylvania has captured her heart. She is happy to call it home, and excited to share the gifts of TriYoga with her new community. Ann supports TriYoga of Central Pennsylvania as the Business Manager, creating spreadsheets that track everything. Inspired by a love for numbers and deep personal connections, she has led and created a variety of cooperative ventures including a family business, the Julian Woods Community where she lives and raised her family, and the Land Trust that holds the community's land deed for future generations. When she needs a break from numbers, she finds joy in Pennsylvania-woodland birding trails, organic home gardening, TriYoga classes, and Co-counseling. Michele is the Communications Coordinator for TriYoga of Central Pennsylvania, a job that links two of her passions: writing and TriYoga. After years of rushing around, she's trying something new: approaching her world from a place of calm. She loves to tell stories through writing, promote Friends & Farmers Co-op and other sources of local food, play with her family and dog Buster, and learn new TriYoga moves. Her 8-year-old daughter is currently obsessed with Side Crow. 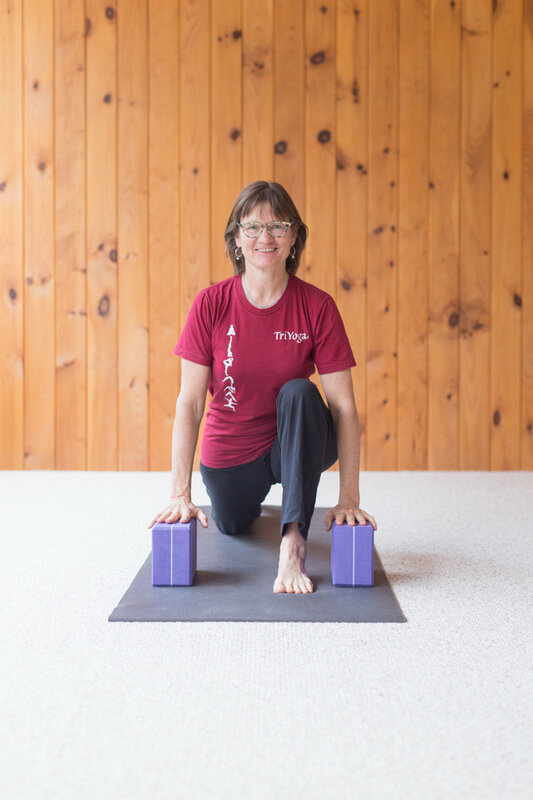 Mairi Sim received her TriYoga Basics Certification in May 2013 and served as a TriYoga of Central Pennsylvania teacher before taking a break. She returned to the TriYoga teaching team early in 2018 to offer Chair Yoga, bringing well-being to a new group of students and expanding the practice beyond the traditional image of yoga on a mat. A Centre County transplant from Glasgow, on the West Coast of Scotland, she found TriYoga exactly 6 months after landing in State College and never looked back. Mairi’s personal journey with TriYoga continues in Therapeutics, where she finds the right amount of movement for her body and mind. She is a firm believer that every body can do yoga. Anne first encountered yoga as a teenager many years ago in a drafty community hall in Scotland. Little did she know then that decades later she would end up teaching yoga in Central Pennsylvania. As a regular student of TriYoga, Anne's need to deepen her own practice led her to Basics and Level 1 Teacher Trainings. As a TriYoga intern and substitute teacher, she then certified to teach Basics in August 2018. TriYoga has helped Anne create balance in her own life and she looks forward to helping others discover the life-changing benefits of the practice. She is especially interested in how yoga can help those affected either directly or indirectly by trauma, addiction and depression. Linda lived in 13 places before she was 8 years old, and grew up (mostly) in St. Louis. She was planning to move to Colorado when a visit to family in Central Pennsylvania ("GORGEOUS") turned her life's course. She came to TriYoga® in 2010, inspired by its beauty and poetry of movement. Armed with a wry sense of humor and a fierce desire to help people and bring more good into the world, she is setting out as a certified Basics teacher to help others find the flow. A firm believer in a dynamic “retirement” with a balance of activity and contemplation, Linda Ruth is building a lifestyle with TriYoga. She received her Prana Vidya certification in 2018 and is currently an intern in Basics Teacher Training. Born and raised in New Jersey, Linda Ruth moved here to raise a family and pursue a career in education. She is a former faculty member of Penn State’s College of Health and Human Development and a certified addiction and recovery specialist. An instrumental volunteer in the opening of TriYoga Bellefonte, Linda Ruth is teaching a meditation classes on Sunday afternoons, and co-teaching a Basics class with Theresa on Thursday afternoons. TriYoga found Kami in 2011. On a whim, she attended a Basics class in her hometown of Howard, PA. She fell madly in love with Yoga’s discipline and structure. Never thinking herself an athlete, she first became captivated by the changes in her physical ability. Next came the challenge and ongoing commitment of quieting the mind. She is excited to take others on this journey and share with them all that she has learned. She truly believes Yoga transcends all stereotypes. Yoga exemplifies the principles Kami lives by: holistic healing, honoring Mother Earth, seeking knowledge in all things, centering of oneself, and always, always forward progress. Kami currently co-teaches the Thursday 5:50 pm Basics class in Bellefonte.